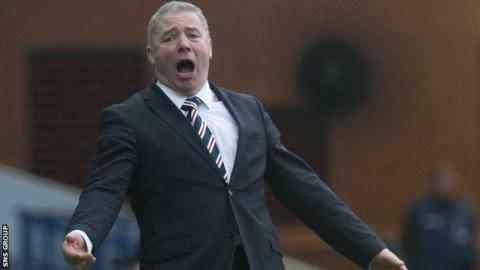 Rangers manager Ally McCoist's position is not under immediate threat, BBC Scotland has learned. Rangers trail Hearts by nine points in the Championship and following Wednesday's 3-2 Petrofac Cup semi-final loss at Alloa, McCoist said he had no thoughts of resignation. It is understood sacking McCoist and his assistants would cost around £1.4m. With the Ibrox club having recently announced losses of £8.3m and struggling to pay wages beyond December, any move to change the management team is off the table for now. McCoist, 52, succeeded Walter Smith in 2011, having served as assistant manager since January 2007. And he has steered Rangers to the League Two and League One titles in successive seasons. But there have been significant setbacks along the way and McCoist has been the subject of flak from supporters in recent weeks. There were more jeers at full-time in Alloa after Rangers threw away a two-goal lead against part-time opponents, with the manager criticising his players' "lack of professionalism". Asked if he was considering resignation, he replied: "No, I'm too concentrated on the game here."